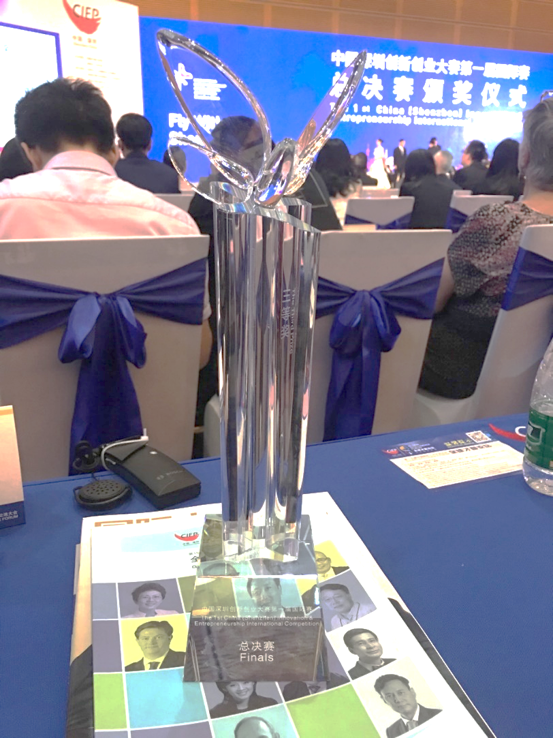 2019.04 Great thanks to FUNAI Foundation, received FUNAI Research Award for Young Scientists. 2019.03 Our work has been reported by The Daily Industrial News, Tokyo TV, NICONICO News, etc. 2019.03 Our work has been presented in ITE-ME2019, INTERACTION2019 and Augmented Human 2019. I am Assistant Professor at Japan Advanced Institute of Science and Technology (JAIST) . Before Joining JAIST, I was a project Assistant Professor and Postdoc Researcher (PD) in User Interface Research Group working with Prof. Takeo Igarashi in the University of Tokyo. I was a Research Fellow of Japan Society for the Promotion of Science (JSPS) from 2014 to 2016. I received my Ph.D. in Computer Graphics under the supervision of Prof. Kazunori Miyata. 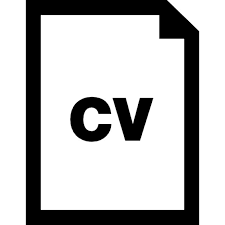 My research interests are mainly in Computer Graphics, HCI, and Digital Fabrication. Especially, the usage of Data-Driven Approaches in creativity support. My Ph.D. work has proposed data-driven approaches for complex flow dynamics. For more details, please refer to page Publications. We propose an interactive system that allows common users to build large-scale balloon art based on a spatial augmented reality solution. The proposed system provides fabrication guidance to illustrate the diffrences between the depth maps of the target three-dimensional shape and the current work in progress. Instead of using color gradients for depth diffrence, we adopt a high contrast black and white projection of the numbers in considering balloon texture. In order to increase user immersion in the system, we propose a shaking animation for each projected number. Using the proposed system, the unskilled users in our case study were able to build large scale balloon art. 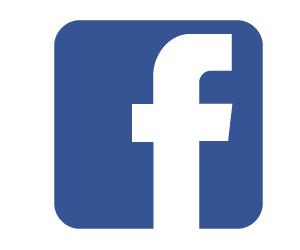 Augmented Human International Conference (AH2019), INTERACTION 2019. Human-augmentation devices have been extensively proposed and developed recently and are useful in improving our work efficiency and our quality of life. Inspired by animal tails, this study aims to propose a wearable and functional tail device that combines physical and emotional-augmentation modes. 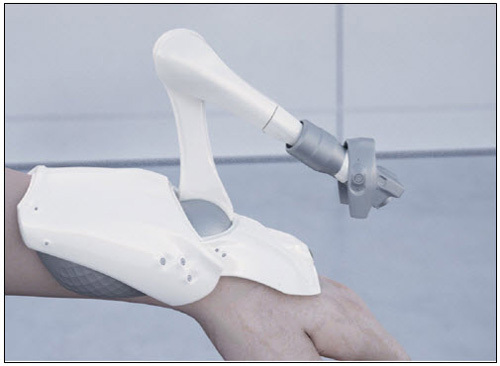 In the physical-augmentation mode, the proposed device can be transformed into a consolidated state to support a user's weight, similar to a kangaroo's tail. 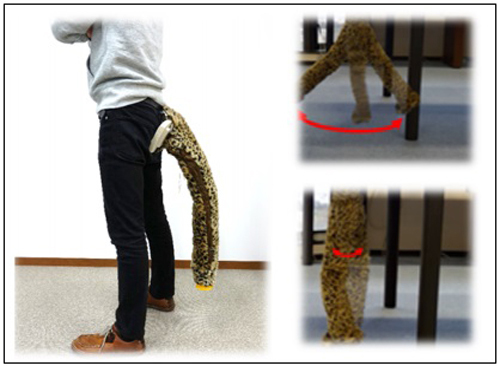 In the emotional-augmentation mode, the proposed device can help users express their emotions, which are realized by different tail-motion patterns. For our initial prototype, we developed technical features that can support the weight of an adult, and we performed a perceptional investigation of the relations between the tail movements and the corresponding perceptual impressions. Using the animal-tail analog, the proposed device may be able to help the human user in both physical and emotional ways. 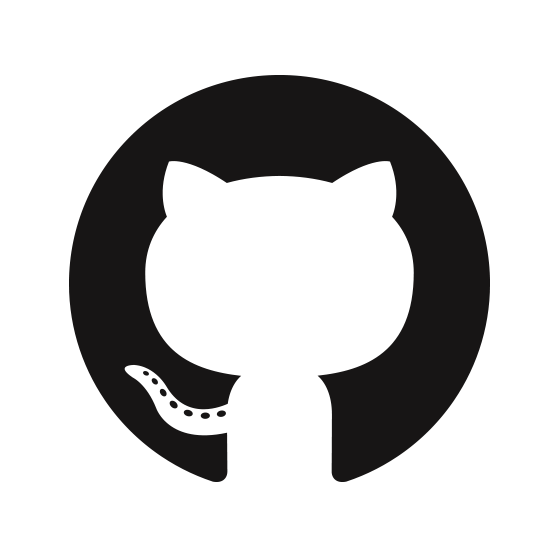 ACM Transactions on Graphics (TOG), 2018 (SIGGRAPH 2018). In this article, we introduce an effient and versatile numerical aerodynamics model for general three-dimensional geometry shapes in potential flow. The proposed model has low computational cost and achieves an accuracy of moderate fielity for the aerodynamic loads for a given glider shape. In the geometry preprocessing steps of our model, lifting-wing surfaces are recognized, and wake panels are generated automatically along the trailing edges. The proposed aerodynamics model improves the potential theory-based panel method. Furthermore, a new quadratic expression for aerodynamic forces and moments is proposed. It consists of geometrydependent aerodynamic coeffient matrices and has a continuous representation for the drag/lift-force coeffients. Our model enables natural and real-time aerodynamics simulations combined with general rigid-body simulators for interactive animation. We also present a design system for original gliders. It uses an assembly-based modeling interface and achieves interactive feedback by leveraging the partwise precomputation enabled by our method. 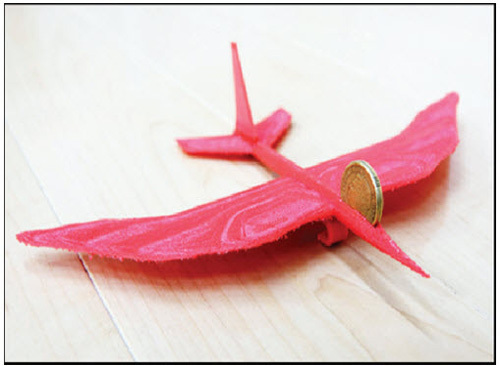 We illustrate that one can easily design various flable gliders using our system. ACM Conference on Intelligent User Interfaces (IUI) workshop, 2018. Taking selfies has become a popular and pervasive activity on smart mobile devices nowadays. However, it is still difficult for the average user to take a good selfie, which is a time-consuming and tedious task on normal mobile devices, especially for those who are not good at selfies. In order to reduce the difficulty of taking good selfies, this work proposes an interactive selfie application developed with multiple user interfaces to improve user satisfaction when taking selfies. 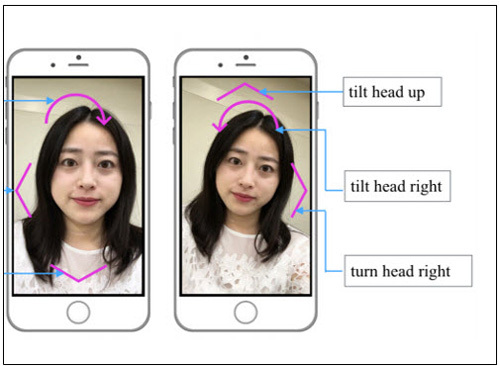 Our proposed system helps average users take selfies by providing visual and voice guidance interfaces on the proper head postures to achieve good selfies. Preprocessing through crowdsourcing-based learning is utilized to evaluate the score space of possible head postures from hundreds of virtual selfies. For the interactive application, we adopt a geometric approach to estimate the current head posture of users. Our user studies show that the proposed selfie user interface can help common users taking good selfies and improve user satisfaction. China Innovation & Entrepreneurship International Competition, 2017. A human-augmented robotic system will facilitate an intelligent manufacturing process with state-of-art information technologies. This project proposes a wearable robotic human-augmented system that can adapt and provide guidance and assistance to achieve solutions of spatial perception, working guidance and accurate operation. This machine is designed to understand its surrounding environment using deep learning and data-driven techniques, and predict human intentions by inertia sensors. 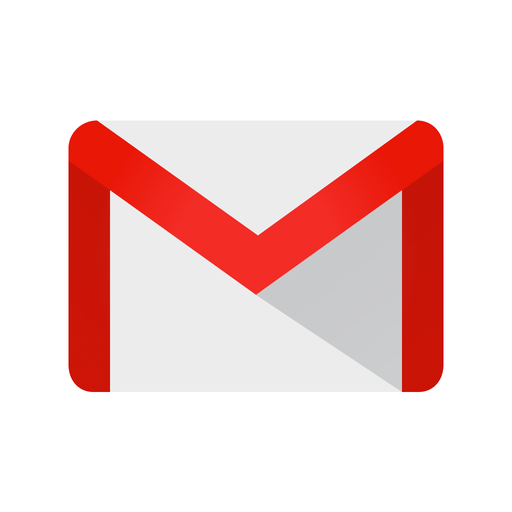 The common users can observe and interact with the current working state via a mobile interface to designate the tasks in the process. The Visual Computer (CGI2017), 2017. Computer animation of trees has widespread applications in the fields of film production, video games and virtual reality. Physics-based methods are feasible solutions to achieve good approximations of tree movements. However, realistically animating a specific tree in the real world remains a challenge since physics-based methods rely on dynamic properties that are difficult to measure. In this paper, we present a low-cost interactive approach to model and animate outdoor trees from photographs and videos, which can be captured using a smartphone or handheld camera. An interactive editing approach is proposed to reconstruct detailed branches from photographs by considering an epipolar constraint. To track the motions of branches and leaves, a semi-automatic tracking method is presented to allow the user to interactively correct mis-tracked features. Then, the physical parameters of branches and leaves are estimated using a fast Fourier transform, and these properties are applied to a simplified physics-based model to generate animations of trees with various external forces. 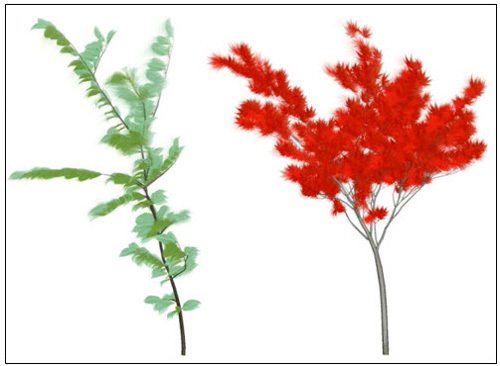 We compare the animation results with reference videos on several exam ples and demonstrate that our approach can achieve realistic tree animation. 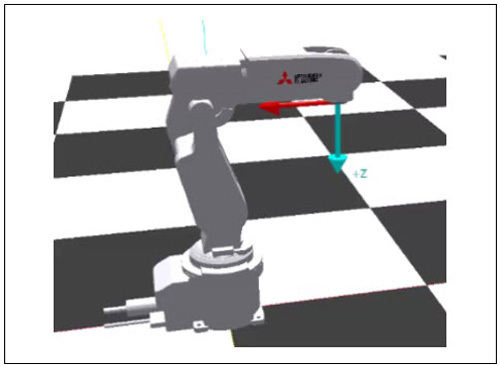 In this talk, a simple application to control the Mitsubishi robot arm involving human movement is introduced. 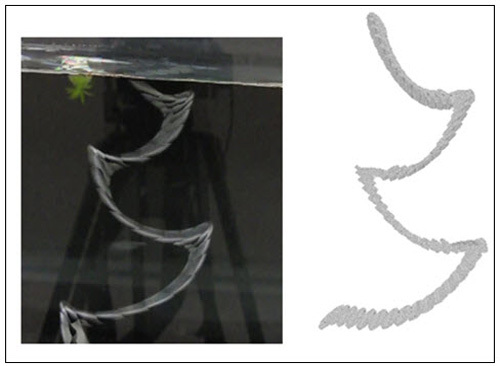 How can a robot do drawing or calligraphy as human is an interesting and challenging task. This work tried to propose a framework for this issue with guiding and control system to accomplish an intelligent human-machine interaction using vision technique. A reduced model technique for simulating dynamical systems in computer graphics is proposed. Most procedural models of physics-based simulations consist of control parameters in a high-dimensional domain in which the real-time controllability of simulations is an ongoing issue. Therefore, we adopt a separated representation of the model solutions that can be preprocessed offline without relying on the knowledge of the complete solutions. To achieve the functional products in this representation, we utilize an iterative method involving enrichment and projection steps in a tensor formulation. The proposed approaches are successfully applied to different parametric and coupled models. Journal of the Society for Art and Science (NICOGRAPH International 2013), 2014. We present the Langevin rigid approach, a technique for animating the dynamics of immersed rigid bodies in viscous incompressible fluid in real-time. We use generalized Kirchhoff equations to ensure forces and torques from the surrounding fluid that create realistic motion of immersed rigid bodies. We call our method the Langevin rigid approach because the generalized Langevin equations are applied to represent the effects of turbulent flow generated at the body surface. The Langevin rigid approach precomputes added-mass effects and the vortical loads from turbulent model, and executes the rigid body solver in runtime, so that this method is straightforward and efficient to the interactive simulations. Many types of rigid bodies with lightweight mass (e.g. 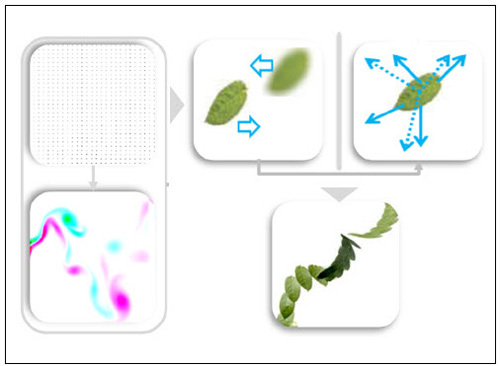 leaf or paper) can be simulated realistically in high-Reynolds-number flows. The Visual Computer (TVC), 2014. ACM SIGGRAPH Asia 2013, Technical briefs. The simulation of immersed rigid-body dynamics involves the coupling between objects and turbulent flows, which is a complicated task in computer animation. 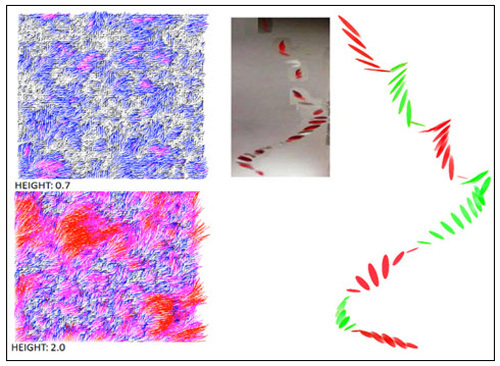 In this paper, we propose a stochastic model of the dynamics of rigid bodies immersed in viscous flows to solve this problem. We first modulate the dynamic equations of rigid bodies using generalized Kirchhoff equations (GKE). Then, a stochastic differential equation called the Langevin equation is proposed to represent the velocity increments due to the turbulences. 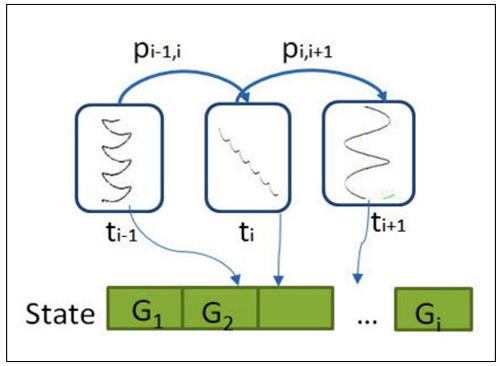 After the precomputation of the Kirchhoff tensor and the kinetic energy of a synthetic turbulence induced by the object moving, we utilize a fractional-step method to solve the GKE with vortical loads of drag and lift dynamics in runtime. 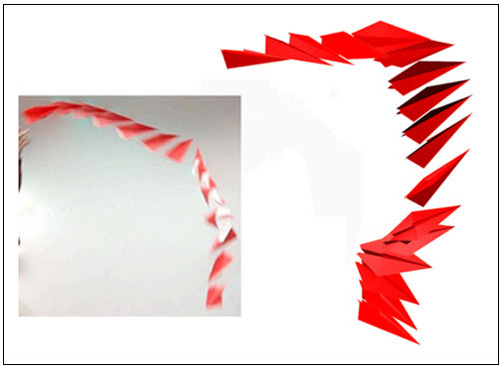 The resulting animations include both inertial and viscous effects from the surrounding flows for arbitrary geometric objects. 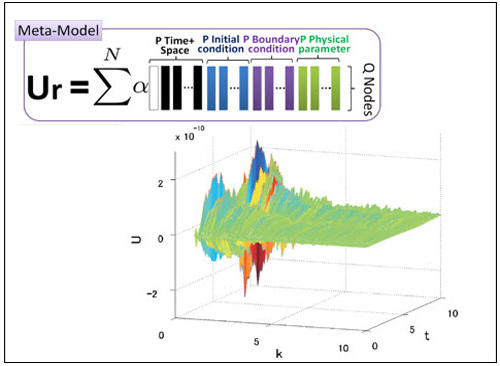 Our model is coherent and effective to simulate immersed rigid-body dynamics in real-time. The free fall motion of a lightweight object is a familiar and spectacular phenomenon in which the object can flutter (oscillate from side to side) and tumble (rotate and drift sideways). However, in computer graphics, we lack the ability to simulate free fall motion in a still fluid. 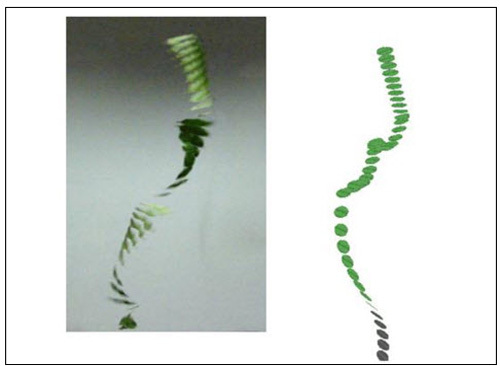 In this paper, we consider all the physical characteristics of free fall in a still fluid, and propose a new procedural motion synthesis method for modeling free fall motion in interactive environments. Six primitive motions are defined in a phase diagram and analyzed separately using a trajectory search tree and a precomputed trajectory database. The global paths of free fall motion are synthesized on the basis of these primitive motions, using a free fall motion graph whose edges are connected using the Markov chain model. In addition, our approach integrates with wind field methods by using an improved noise-based algorithm under different wind speeds and object release heights. This approach provides not only realistic results in both a still fluid and a wind field but also rapid computation for realtime applications. ACM SIGGRAPH Asia 2011, Sketches. We present in this paper a framework that generates free fall motions for the object within a still fluid. We introduce a new motion synthesis approach where six characteristic motion prototypes of free fall are defined and synthesized, and then the motion trajectory is specified form free fall motion graph. We automatically create motion sequences using trajectory search tree and pre-computed trajectory database. The proposed approach can produce realistic and controllable free fall motion that could be applied in many different applications, including virtual reality, game and other entertainment productions. Free fall motions, such as fluttering (oscillate from side to side) and tumbling (rotate and drift sideways) of lightweight objects or objects in the strong resistance fluid with high Reynolds number, are spectacular and familiar but we lack the predicable and realistic simulation of the phenomena in computer animation and other related fields. 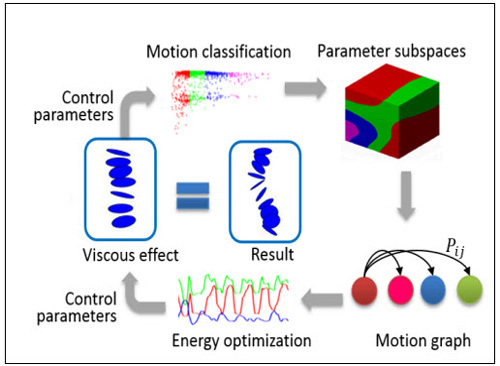 We propose a new data-driven approach for procedural motion synthesis by using free fall motion graphs in interactive environments. Six motion prototypes are defined in phase diagram and synthesized separately using trajectory search tree and pre- computed trajectory database. In motion graph, we decide the motion types of object in designated initial conditions and the motion types are constituted by motion prototypes. To get more natural and pleasing motion paths, we combine numerical simulation and experimental results of this topic from Physics. Depending on the data from thousands of experiments, we can simulate the unresolved physical problem, including chaotic motions or motions in three dimensional environments successfully by our approach. Other physical characteristics in free fall, such as rotation, are also figured out well. Optimizations are proposed for synthesized results by practical experiments to adjust and achieve a reasonable visual quality of the phenomena. The Institute of Image Information and Television Engineers Technical Report, 2010. 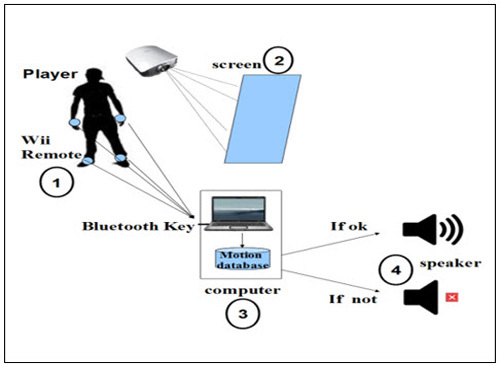 This paper describes a new way of playing music by using motion tracking with Wii MotionPlus and sensor accelerator, by a person. The results of motion detection produce sound and make him/her be able to play a song by fo11owing the various movements like in a musical score. The gestures to be reproduced are projected in front of him/her, by using a video projector. The detection of Wii Remote accelerations and Euler angles will produce sound effects 1ike volume variation. Japan Advanced Institute of Science and Technology, 2015. The real world is complex and specular: a leaf falling down from a tree side byside, a coin moving underwater swaying left and right, and the falling snowflakes dancing up and down in even still flow environments. Unfortunately, the virtual worlds under the conventional animation techniques utilize the ideal models with no consideration of the detailed effects of the flow environments, which take account of the inertial, viscous, and turbulent features in high Reynolds number flow. Although the physical simulations have dramatic success in 3D films, games and virtual reality applications in recent decades, the simulations of unsteady and turbulent dynamics frustrate researchers in both computation cost and simulation fidelity. To solve these issues, this dissertation proposes a new topic, immersed rigid body dynamics, into the real-time computer graphics community. 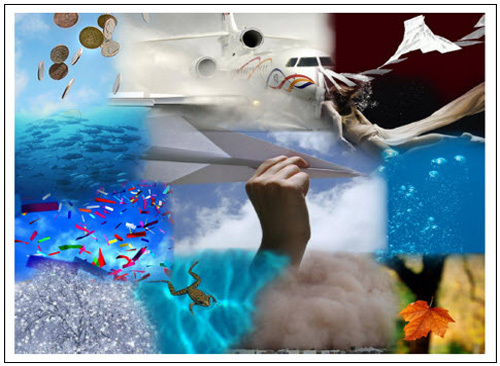 It is clearly different from the other traditional topics in computer graphics that the research aim of immersed rigid body dynamics is to simulate the motion of rigid body fully immersed or submerged inside real flows, and strongly coupled with the surrounding flows. This dissertation presents a family of algorithms for real-time simulations of immersed rigid body dynamics in computer animation. These algorithms are built on data-driven simulation methods to simulate the rigid body dynamics with the flow effects in computer environment. These approaches make it feasible to achieve realistic simulation results in low computation cost. In addition, a promising prior reduced model of dynamical systems is introduced for the parameter identification into computer animation.